Get ready to cheer your heart out! Join over 15,000 spectators along the course to make Halfsy runners feel like rocks stars. The essential guide for spectators of the Good Life Halfsy. Includes maps of the course, start line, finish line, and cheer stations as well as preferred driving routes and directions. 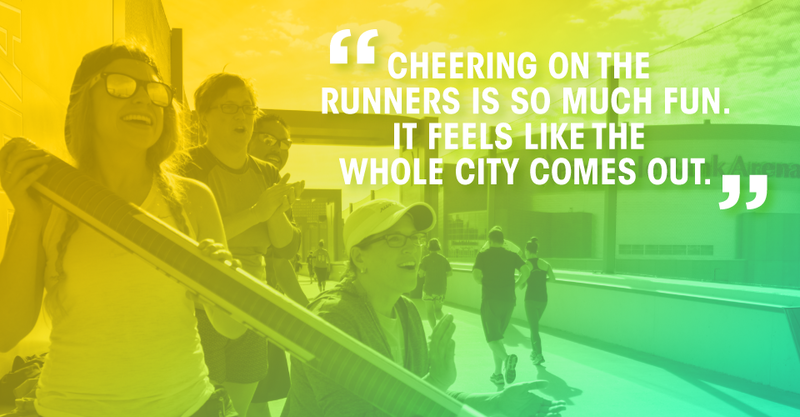 If you’re not running the Good Life Halfsy, there’s no better way to spend the day than cheering wildly with other like-minded fanatics. Cheer stations are the best locations on the course to spectate. They’ll have music and will be stocked with vuvuzelas, cowbells, signs, thunder sticks, and other assorted goodies. See maps below for cheer station locations and best driving routes. Get the inside scoop and be the first to receive the latest event information.